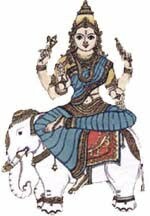 Goddess Indrani is one of the Sapta Matrikas – the seven divine mothers or Saptamatris in Hindu Religion. Goddess Indrani takes her name from Indra – the king of the Devas. She has similar characteristics of Indra and the same Vahana or vehicle – white elephant. A puja dedicated to Goddess Aindrani is performed during the Ashada Navratri. Goddess Indrani is depicted as having four arms and she holds in two hands Vajra and a flag with a symbol of pot. The other two hands are in Varada and Abhaya Mudra. Her complexion is red and she wears a crown and beautiful ornaments. She is believed to reside below a kalpaka tree. Indrani is usually depicted as sitting on her Vahana or Vehicle which is a white elephant. She is believed to help in destroying jealousy. Goddess Indrani is rarely worshipped as an independent deity and is usually part of the Saptamatris.